Millions have been denied the right to cast a ballot after getting out of prison, but now they’re organizing a return to the polls. Gregory Finney, 53, routinely works on New Orleans elections. But the experience is bittersweet, because he’s on parole. In Louisiana, parolees can’t vote. “I can hold up a sign saying, ‘Vote for this candidate,’ but I can never vote myself,” says Finney, who is on lifetime parole for possessing 10 grams of narcotics. Also barred from the vote is Kenneth “Biggy” Johnston, 67, a political junkie and Vietnam vet who can talk for hours about New Orleans candidates though he has never entered a polling station. The father of five left prison 23 years ago and has never been cited for a parole violation. But that doesn’t matter where the ballot is concerned. “I know the importance of the vote. But looks like I’ll never have that right, the way the law reads now,” Johnston says. It is election season again. Across the country, get-out-the-vote groups are handing out registration forms and spending millions on clever ad campaigns meant to inspire Americans to head to the polls. Yet there is one very large group that often must stay home: convicted felons. Disproportionately concentrated in the country’s urban centers, America’s disenfranchised felons number 5.85 million, according to a report from The Sentencing Project. But a burgeoning get-back-the-vote movement is gaining strength, with ex-offenders like Finney and Johnston at its center. Kenneth “Biggy” Johnston, Norris Henderson and Randy Tucker stand in front of New Orleans City Hall. Among their goals is to reform laws like Louisiana’s, which bar voting for those on probation and parole. That was the case in Maryland until earlier this year, when the legislature overrode a gubernatorial veto to restore the vote to anyone leaving prison or on probation. The move will add an estimated 40,000 voters to the state’s rolls — 20,000 from Baltimore alone. But while Maryland’s reform serves as inspiration, the get-back-the-vote movement has a big job ahead. All but two American states bar felons from voting while in prison and the majority continue to keep offenders out of the polls for years after they return to their communities. Adding to the challenge is the fact that the same law can play out differently in different states, due to inconsistent parole and probation policies, which vary wildly. 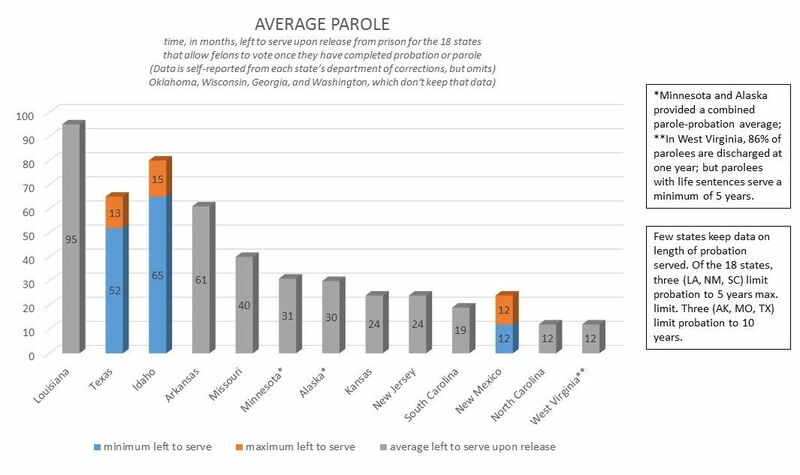 For instance, Louisiana parolees must wait, on average, nearly eight years to vote again and more than 11,000 current parolees must wait more than 11 years. On the opposite end of the spectrum, the average wait in West Virginia is one year. In a handful of states with the most draconian laws that permanently disenfranchise felons, more than 7 percent of the adult population is disenfranchised, according to a 2012 Sentencing Project study. In Louisiana, about 3 percent of voters are disenfranchised, according to that study. But of that 3 percent who has lost the ballot, most are urban residents hailing from the state’s largest cities. More than one-quarter come from the New Orleans metropolitan region, with 10 percent from the city of New Orleans itself. A recent, preliminary ZIP code analysis by the advocacy group Voice of the Ex-Offender, or VOTE, found that in some New Orleans neighborhoods, the proportion of voters disenfranchised was well into the double digits. More than 22 percent of adults in parts of the Iberville-Treme neighborhood made the secretary of state’s list of barred voters; they’re either in prison, or on probation or parole. Other ZIP codes weren’t far behind, including Central City (19 percent), the Ninth Ward (15 percent) and parts of Broadmoor, Algiers and eastern New Orleans (10 percent). All of these areas are predominantly African-American, with a high concentration of people living in poverty. Chris Uggen, a University of Minnesota professor and one of the authors of a 2012 Sentencing Project report, predicts that lengthy parole and probation terms might actually increase disenfranchisement in coming years, even if incarceration rates continue to decline nationally. “States are moving more to community supervision, moving people to probation and parole instead of penitentiaries,” Uggen says. “But the irony is that this trend could result in more people disenfranchised for longer periods of time.” He came onto the national radar in the early 2000s with research that suggested a number of close, high-profile elections — including seven U.S. Senate races — would have almost certainly ended differently if felons could vote. The calculations were outlined in a 2006 book he co-authored on the topic called Locked Out: Felon Disenfranchisement and American Democracy. In a dramatic example, Uggen and co-author Jeff Manza found that if felons had been allowed to vote in Florida in 2000, Al Gore would have defeated George W. Bush by about 60,000 in that state and been elected president. But, he says, disenfranchisement’s effects are most pronounced at a local level, where margins are narrower. In a scan of Orleans Parish election results over just the past few years, it’s easy to find races for the City Council, school board, the state legislature or district judgeships where the results turned on hundreds or even dozens of votes. In 2006, Ray Nagin became mayor by a margin of just 5,300 votes. Meanwhile at any given time, roughly 8,000 New Orleanians with felony convictions — parolees who have returned home from prison and probationers who never went there at all — are unable to vote. The Sentencing Project’s executive director, Marc Mauer, remembers the call from a Richmond Times-Dispatch reporter. It was about 1996 and the newspaper had done an analysis showing that about one-quarter of black males in the state were disenfranchised. “I was shocked to hear this, of course,” says Mauer, who soon dug into state policies and U.S. Department of Justice data on the topic, issuing his first estimates of national felon disenfranchisement in 1997 and 1998. The latest Sentencing Project data shows that black Americans are more than four times as likely to lose voting rights than other Americans, with 1 in 13 black adults, or 7.7 percent, disenfranchised nationally, compared to 1 in 56 non-black voters. Since the criminal justice system is disproportionately male, black men are particularly affected: The Sentencing Project estimates that, if incarceration continues at current rates, 30 percent of black men in the next generation could be disenfranchised at some point in their lives. For majority-black cities, the impact is stark. In Atlanta, 1 in 7 black men were disenfranchised because of a felony conviction, according to a 2004 study of felon disenfranchisement in Georgia published by The Sentencing Project. On a community level, that translates to entire neighborhoods with a sizable portion of the electorate silenced. The Sentencing Project identified 11 neighborhoods in Atlanta alone where more than 10 percent of black males were disenfranchised. In the U.S., laws that limit the ability of felons to vote began to gain popularity around the same time that the 15th Amendment gave black men the right to vote. By 1869, when the House and Senate passed the constitutional amendment, 29 states had implemented such laws, according to The Sentencing Project. In Louisiana, after the state enacted its disenfranchisement laws, voting by black people plummeted from 130,000 in the 1896 election to 1,342 in 1904. Over time, more than a third of states have adopted laws like Louisiana’s, barring felons from voting while in prison or under correctional supervision. Beyond the one-third of states with laws like Louisiana, disenfranchisement statutes are a crazy patchwork. Uggen’s book documents what it calls “staggering disparities” of voting laws across states, noting that someone convicted of possession of an ounce of marijuana can be disenfranchised for life in Florida while someone convicted of first-degree murder is still able to vote in Maine, which imposes no barriers on voting and even allows its prisoners to cast ballots. In 2003, Randy Tucker was released from the infamous Louisiana State Penitentiary at Angola. He had spent 25 years there, entering at 22 years old, as a convicted armed robber. Before Angola, Tucker had spent his young life imitating what he’d seen around him, growing up in one of uptown New Orleans’ most notorious housing projects. “Every robbery they charged me with, I actually had something to do with,” he says. But while in prison, he gained a new lens on the world, through a now-legendary group of prisoners called the Angola Special Civics Project, which was known for researching, charting and analyzing Louisiana’s state laws. One of the state laws they came to analyze was the law regarding felons and the right vote. Special Civics Project leader Norris Henderson remembers being startled when he realized that, contrary to common perception, people could vote after leaving prison. He believed he had discovered “a sleeping giant” — a voting bloc of people that had the power, if organized, to significantly influence the state’s policies and leaders. While Tucker and Henderson were incarcerated, they often discussed how to mobilize this slumbering powerhouse. And so, once Tucker was released, he knew what he had to do. The New Orleans man found a job as a paralegal, saved up a little money and then, through a mechanic he knew, bought a maroon 1973 Lincoln Town Car. Soon enough, he had put more than 150,000 miles on it, driving around the state with stacks of voter registration cards, telling people that their felony record did not preclude them from voting. He’d pull out a registration card and a black pen whenever he met someone who was “off paper” — finished with their required stint on probation or parole. When Tucker was in New Orleans, he worked alongside Special Civics Project colleagues who also had earned their release from Angola and had become outspoken apostles for felon voting. In 2004, two Civics Project leaders, Henderson and Johnston, started VOTE and began doing voter registration on the street in front of the courthouse and at community meetings. Whenever anyone refused to complete a registration card, citing a criminal record that they thought barred them from voting, Henderson would shake his head and explain. “You’re still in the loop,” he’d say. Henderson’s voting rights are restored. But, like thousands of other parolees, Tucker doesn’t expect that he’ll ever be eligible to go to the polls. Tucker, 57, doesn’t have an entire lifetime on parole hanging over him like his VOTE colleagues Gregory Finney and “Biggy” Johnston. But he will be on parole until he’s 80, eight years past the average life expectancy for a black man in America. “I’ll probably be dead before I have the right to vote,” says Tucker. As a result, Tucker’s life mission has been to ensure that others can vote in his stead, he says. A decade later, thanks largely to efforts by VOTE and another, newer, advocacy group called STAND With Dignity, more New Orleanians with felony records are voting, says Frank Palestina, who recently retired as district administrator of the probation and parole office for the New Orleans district and now works as the director of New Orleans Pretrial Services for the Vera Institute of Justice. Palestina saw an increase in voting-related requests during his last years of work there, especially before presidential elections. It was “routine and common” for probationers and parolees who had finished their terms to request closure letters that they could take to the Orleans Parish Registrar of Voters to prove their eligibility, says Palestina, who notes that the investigations were labor-intensive. 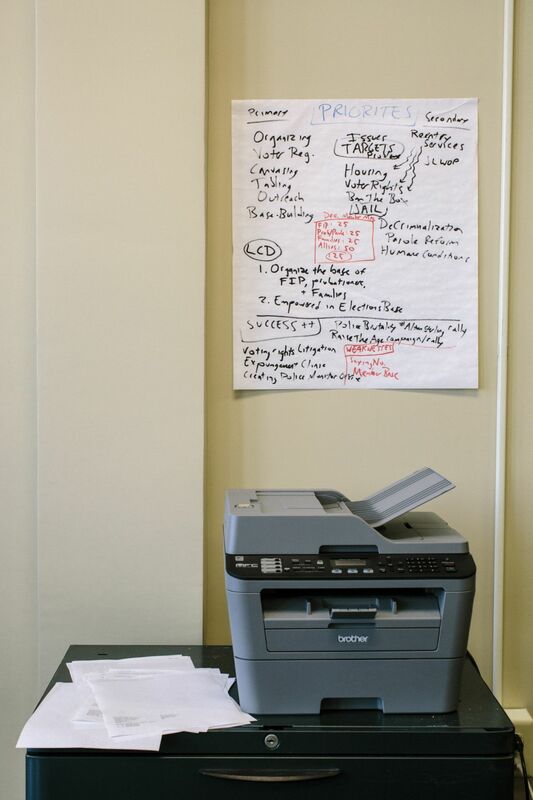 A list of primary priorities is on display inside the VOTE headquarters. Over the next year, that number of new voters could grow even more dramatically. 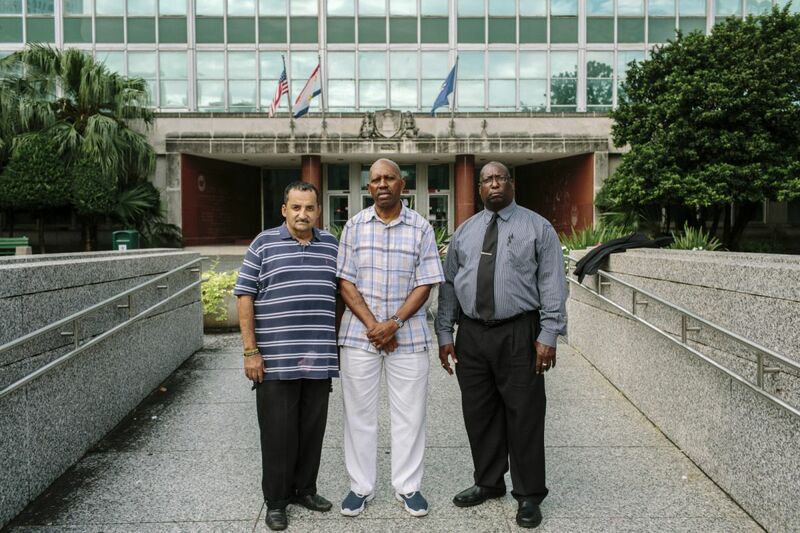 In July, Tucker, Henderson and other members of VOTE stood on the steps of New Orleans City Hall with a group of prominent civil liberties lawyers and announced a voting rights lawsuit against the state of Louisiana. By poring through the notes of the 1973 Constitutional Convention that led to the current Louisiana Constitution, the plaintiffs had found evidence that the constitution’s authors meant to withhold the vote only from those imprisoned or, as the constitution’s authors wrote, “under an order of imprisonment.” But soon afterward, in 1976, plaintiffs argue, Louisiana lawmakers violated that constitution by passing a law barring felons from voting while on probation or parole. “This Act of the Legislature is an unconstitutional violation of plaintiffs’ right to vote guaranteed by the 1974 Louisiana Constitution Article I, Section 10, and resulted in the illegal disenfranchisement of thousands of Louisiana citizens,” the lawsuit contends. A ruling in favor of the plaintiffs could restore the vote to nearly 70,000 people. The first hearing on the matter is scheduled for October 31. Finney gets wistful when he imagines being able to vote. He remembers how his mother, a school cook, used to make him and his siblings sit in the car while she ran into the polls. “She never missed a vote.” The reason why was clear to him even then. “It didn’t take no rocket scientist to tell me that I needed a voice to make change,” he says. Support for the data analysis part of this story came from Unprisoned: Stories From the System, a New Orleans-based initiative funded by Association of Independents in Radio. Katy Reckdahl is a New Orleans-based news reporter who is a frequent contributor to the New Orleans Advocate and the Hechinger Report and has written for The Times-Picayune, The New York Times, The Daily Beast, The Weather Channel, The Nation, Next City, and the Christian Science Monitor. William Widmer is a freelance photographer who spends most of his time in New Orleans, Louisiana. He’s a frequent contributor to The New York Times and covers news and feature stories throughout the South.